Former Burberry CEO Angela Ahrendts chose to leave the British fashion house for Apple largely because of the opportunity to work with Tim Cook, she hinted in a recent interview, choosing to serve alongside the Apple chief executive as he reshapes the company. "I did not expect to be moved by the man, and I left and I thought, 'Ohhhhh! My life was perfect,'" Ahrendts told Fortune's Adam Lashinsky, recalling her first meeting with Cook. "Aaargh, why, why, why?" Ahrendts praised Cook's integrity and personal values, saying that "[nothing will] take him off of always doing the right thing. Not just for Apple, but for Apple's people, for communities, for countries. The world needs more leaders like Tim." Since joining Apple just under one year ago, Ahrendts has kept a relatively lower profile than many of her peers on the company's senior leadership team. Cook and design czar Jony Ive have been the subject of numerous features, while environmental chief Lisa Jackson and software and services bosses Craig Federighi and Eddy Cue are routinely seen in the press and at industry events. This has been a conscious shift from the famously opaque practices at Apple under late cofounder Steve Jobs. "My objective is to raise the public profile of several of the folks on the executive team, and others as well," Cook said separately. "Because I think that's good for Apple at the end of the day." "A true coach is happy with his star players getting media time," former Apple and BeOS executive Jean-Louis Gassée added. "Tim Cook is a true impresario who takes care of his prime donne. As long as the box office is good, the impresario will do that." 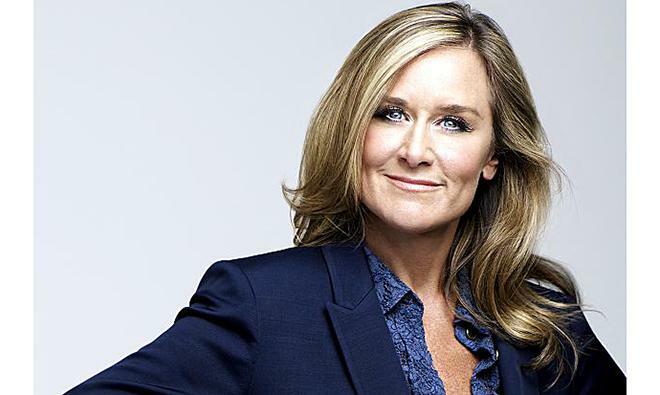 While many assumed Ahrendts was primarily recruited for her expertise in fashion, given Apple's move in that direction with the Watch, she said that Cook's focus was first and foremost on the future of retail itself. "We talked about the future of retail [at her first meeting with Cook], about where is retail going and what is Apple's role in that. We talked much more about the future. We didn't talk a lot about fashion." According to Cook, Ahrendts has not suffered from the same culture shock that her axed predecessor, John Browett, did upon joining Apple. Browett's failure was "a reminder to me of the critical importance of cultural fit, and that it takes some time to learn that," Cook said. "Because you want to push the people who are doing great. And you want to either develop the people who are not or, in a worst case, they need to be somewhere else," he added. Cook believes Ahrendts is "a perfect culture fit. Within a week, it felt like she'd been there a year. And now it feels like she's been there multiple years. When you start to finish each other's sentences, this is a good thing."